What are the essential ingredients of a successful restaurant? For a good answer, Con Christopoulos is the man to ask. The man with the sauciest fingers in the business - so many pies does he have them in - mixes magic ingredients to make his myriad ventures successful. Part of the magic is that said successful ventures are never niche. 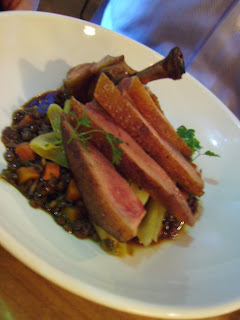 European, City Wine Bar, Self Preservation, Journal (Canteen): they don't pigeon-hole neatly into a standard restaurant definition, of an outlet simply offering well-cooked fare for lunch and dinner. Therein lies the greatest difficulty in summing up the Christopoulos empire: it would be lovely to bunch them all together, but each venue is unique; the main factor linking them is their aptness for the overall Melbourne dining scene. Gill's Diner, opened in 2007, is a great example of a Christopoulos venture that is not only innovative but also definitively 'Melbournian' example. A restaurant with a flair for cross-European cuisine (albeit rooted strongly in French and Italian), in a laneway, with a wood and concrete fitout that feels rustic and 'now' at the same time. The decor is marvellous: wooden door frames; squat, square, hefty dining tables; schoolhouse chairs; tiles on the walls. It's up-market bistro but all the menu items are on a blackboard (note to establishment: great effect; not so handy for the vision-impaired), and specials lists are dotted around the restaurant. As for music, from cafe to bar to this restaurant, vinyl is in vogue. Luckily the wine list comes to the table in printed form. It's superb, and requires more consideration than would be comfortable with a blackboard at squinting distance. Most excitingly, they stock Henry of Harcourts cider. Wines by the glass start at $7.50 and some excellent local drops (for example, Geppettos from Crittenden) come in under $40 for a bottle. We drank Chestnut Hill 2005 Sauvignon Blanc: far more caramelly than is common for the varietal, with a huge mouthfeel but enough delicacy to match a range of food. The food too somehow manages to nail classic bistro dining, as well as modern Australian, the best of the Iberian and Mediterranean, and stay seasonal and, where possible, local to boot. A farmhouse terrine arrives as a slab of pink tenderness, wrapped in bacon fat and with a curious dark bullseye. 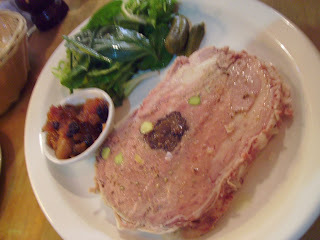 The centre feature reveals itself as a drunken prune, doused with sherry, a fabulous sweet foil to the saltier meat. The chutney, too, was curranty and ever so slightly piquant. Seafood is handled adeptly. 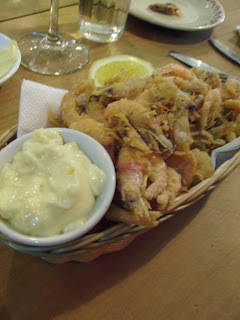 Fresh gamberetti with lemon and aioli are served in a low-key basket, resembling a catch of whitebait as much as their fleshier cousins. There are oodles of them, crisp with a dusting of batter. The aioli is strong on creaminess and light on tartness, the emulsification having been handled expertly. 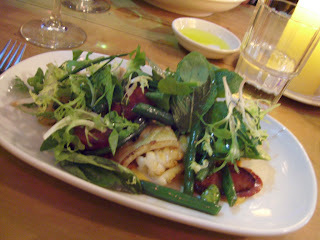 The chalkboard menu heralds the calamari as coming with chorizo and broad beans, an irrestible combination. It was somewhat disappointing that green beans were far more in evidence. The waiter described the broad beans as a 'smattering', on a 'light, entree dish'. The richness of the garlic sauce pooled on the plate lifted it up a weight level and perhaps just a description of 'beans' would have resulted in better-met expectations. The calamari itself, however, was delicious. Not to be outdone, the meat portions are also wonderful. 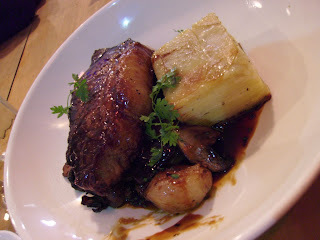 Porterhouse steak, with dauphinoise potatoes (served here at room temperature - accidental or intentional? We didn't ask), sits in a blissful reduction of its juices. The menu item of 'roast duck breast' was ever so much more - five plump pink carvings plus a leg. They sat on carrots and lentils in a sauce that could have been ladled from an urn marked 'Gluhwein' at a Weihnachtsmarkt. The service, decor and approachable yet succinct menu combine to make this an eminently comfortable and rewarding dining experience. Always better to check out a fellow blogger's review rather than rely on the usual disappointing websites. 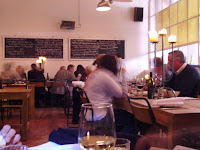 Am off to dinner now in Gill's and am looking forward to it having read your review. Cheers. Hey Mairead, hope it's a fantastic dinner!